Pressing the keys E and I. Now that you already know how to press all keys of the base row, and you have also practiced with all keys that index fingers could press following lessons are going to be very easy to learn, because all finger movements are identical (and even easier) to the ones you practiced using the index finger. 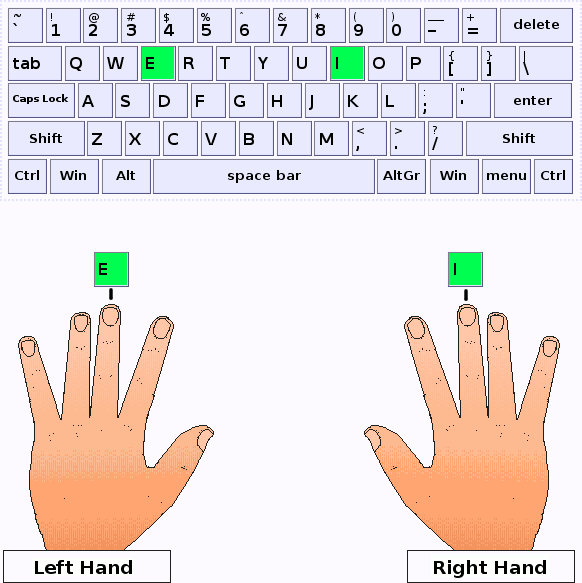 In this typing lesson we are introducing the new keys E and I, but as in previous lessons, we don't forget the other keys you have learned to press. Because it is the first row of keys, learning these ones it is going to be easy. Be careful when pressing the keys, and respect the finger movement described on this page.